There is wide agreement that the United States needs more options for acquiring new energy sources. There is wide disagreement, however, on what we should be willing to risk in the process. A newly popular process to extract oil and gas highlights this issue. Fracking is more accurately called hydraulic fracturing. It involves injecting pressurized fluid into below-ground rock formations to increase the flow of oil, natural gas, or other fossil fuel substances into wells for extraction. Fracking could produce billions of barrels of oil in the United States alone. Increasing domestic exploration is widely accepted as a good idea, since importing oil can be expensive, especially when the supply is at risk from high prices imposed by OPEC, embargoes, and even terrorist threats. In addition, fracking also promises to create thousands of new jobs. The sale of leases for fracking sites could raise money to fund roads and schools. 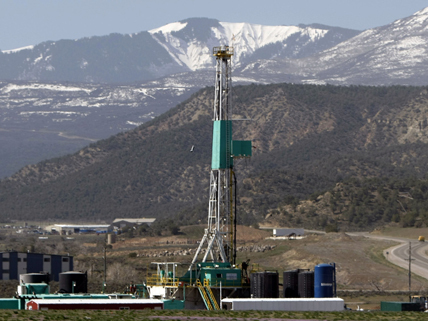 Fracking may even lead to development of clean, renewable geothermal energy. So on one side of the equation, fracking makes good economic sense. Other factors must be considered, however. The environmental costs could be staggering. Of major concern is the mounting evidence that links fracking with earthquakes. The problems develop less from the fracking process itself than from the need to dispose of millions of gallons of contaminated wastewater. One option is to push the water deep underground. There, according to a geologist who specializes in seismic research, the fluid can lubricate fault lines—basically greasing the wheels of the earthquake process—and destabilize the rock. If the water isn’t pumped underground, it has to be decontaminated and recycled, which is an expensive proposition. There are also reports of severe groundwater contamination near fracking sites. In one town, residents’ tap water was so polluted it could be set on fire. Whether the benefits of fracking will outweigh the costs remains to be seen. Learn about fracking mechanics and methods. Check out a diagram of fracking methodology. Compare various countries’ oil reserves. This article describes a USGS report that finds a correlation between fracking activities and the dramatic increase in the number of earthquakes. If this is going to effect our ground water it’s not worth it! Getting more oil is not a solution! We need and CAN find clean, cheap, renewable fuel! If we pull together we can do this! Our guv isn’t going to like that one bit. Let me guess, he’ll join a multi-GOP led-state lawsuit cagnhirg the federal gov’t doesn’t have any constitutional right to tell the states what they can or can’t do with their own natural resources. Pennsylvania is fracking coturny! Well, we pale in comparison to Texas volume-wise, but PA is the fastest growing fracking operation in the coturny I think. There are a lot of fracking talks at CMU. I should watch that movie. The impression I have of shale gas is that developers are moving too quickly for government to regulate safety and environmental issues, but state government in PA is getting such a boost in commerce that its sort of in their interest to encourage the fast growth. I saw a talk from Tom Ridge in the fall just on shale gas and he is all for it but there were lots of people with different (and vocal) opinions in the room. If fracking is taken to a clean renewable energy then how will that happen?